If there was ever any doubt that the results of the UCOP audit and the University's response has damaged UC's political standing, the 2017-2018 budget should put those to rest. The Budget displays a remarkable suspicion of UC. In this post, I want to indicate 3 of the crucial indications of that suspicion. I hope to discuss some larger questions about the state of UC governance and ways to overcome its evident difficulties in a follow-up post soon. The bottom line is that the new budget provides less state money directly to campuses while increasing the demands that the State is placing on the system. Let me explain. 1. The 2017-2018 budget provides an additional $132.2 million increase to the university's base funding. (21) But at the same time, and contrary to previous practice, the State has declared that $296.4 million of the General Fund support will be used to support the Office of the President. (An additional 52.4 million will go to the ever increasing costs of UCPath). (21) Crucially, these set asides mean that the $348.8 million are not additional monies but must be taken out of the base state funding. In other words, less General Fund money--which is crucial to support the core--will be going to the campuses. The Legislature has taken this step because they believe it will provide them greater leverage over OP and also eliminate the burden of the campus assessments that have previously funded the President's office. I am not persuaded that we want legislators deciding which systemwide programs UC should pursue. But leaving that issue aside, there are important unintended consequences here. Previously UCOP had been funded through assessments according to calculations on total campus funding, personnel, and students. This system meant that OP tax was levied on all of the auxiliaries, medical centers, and businesses of the campuses in addition to the core. Now, in effect, OP is being funded solely by the core. Eliminating the assessments and funding OP through the general fund is designed to lessen the demands on campus resources. But because auxiliaries are no longer being taxed to support OP this shift may increase the financial constraints on placed on the core functions of teaching and research. This particular line item does nothing to reduce the costs of UCOP. The same amount of money is simply being drawn from a more narrow range of university functions--in fact the functions that make a university a university. Whatever its intent, the legislature has effectively shifted funding from the core to auxiliaries. Now it is possible that individual campus chancellors will work out some sort of internal tax to transfer money back to the core from the auxiliaries. But that will be a matter of internal politics and power. It is also an even less transparent system than we have now since these transfers will differ campus by campus. It will face potential legal obstacles if monies are shifted from overhead to undergraduate teaching. How all of these changes will effect the uniformity of funding per student that has resulted from rebenching is unclear to me. 2. At the same time, the budget withholds an additional $50 million until the Director of Finance certifies that UC has met certain specific legislative and gubernatorial demands. Some of these are easy to accomplish and unobjectionable: progress on implementing the 33 recommendations of the State Auditor that UCOP has already agreed to; eliminate retirement supplements for senior managers; and provide better justification for presidential and systemwide initiatives and clearer budget presentations. But two are deeply problematic. The first is the completion of pilot programs in Activity Based Costing already underway at Riverside's College of Humanities, Arts, and Social Sciences and to be expanded to two other campuses. As Chris has discussed, ABC, though claiming simply to be a tool for ensuring that funding goes where it is needed, in practice its effects are to drive universities towards the reduction of costs and the establishment of arbitrary benchmarks (otherwise known as speedups) while sidelining the question of quality. Equally importantly, as Academic Chair James Chalfant has pointed out, the budgetary demand for ABC intrudes upon the autonomy of academic decisions, "the delivery of the curriculum is an Academic Senate function and the allocation of teaching resources is an academic decision; such decisions are based on academic priorities, and any methods used or choices made to optimize the educational enterprise with available resources must be left to academic departments and schools." The second is a demand that all campuses achieve a 2-1 first year/transfer ratio in applications (with the exception of Merced and UCSF). I suspect that this demand has its long term roots in the original Master Plan expectation that lower division students would make up only 40% of the overall undergraduate population. (24) To achieve that goal, something like a 2-1 structure would have been necessary. But that expectation was for the system as a whole not for every campus. UC as whole is on the verge of achieving this 2-1. The sticking point appears to be that Riverside and Santa Cruz have not been able to meet this benchmark. But all evidence suggests that both campuses have admitted as many transfer students as have met UC requirements (I will leave aside the ridiculous idea of thinking that Riverside, which for decades has been the most important campus for achieving social mobility, is turning away eligible transfer students). If there was some evidence that these campuses were dragging their feet it would be one thing. But instead we have an overly rigid demand threatening to reduce UC funding even further. Both ABC and the Transfer demands are examples of the imposition of ahistorical and non-contextualized demands far removed from the actual practices or local conditions of the university's campuses. 3. Finally, the budget demands a 1500 undergraduate student increase. There are no additional funds for this increase, simply a command that money be shifted from systemwide and presidential initiatives. (6440 sec2.2) Despite all of the talk over the last few years of the growing state support for the system, in reality the state has not been providing adequate funding for the increased student populations and the University has not been directing adequate funding towards faculty and front-line staff to meet the enrollment growth. I think that all of us are aware of growing class sizes, increased demands on staff, inadequate housing for students etc. This budget will make things worse. I'll discuss internal governance issues in my next post. But for now I think that it is clear that this particular budget is a step backward in maintaining UC quality. It is a dramatic display of the increasingly broken relationship between UCOP, the Regents, and the State that affects all of us who work or study at the University. On June 2, following the negative state audit of budget practices at UC's Office of the President (UCOP) and then regental partygate, the governor's office announced four new appointments to the UC Board of Regents. This rekindled some press interest in the conflict between the sudden announcement of completed appointments and the process described in the state constitution. 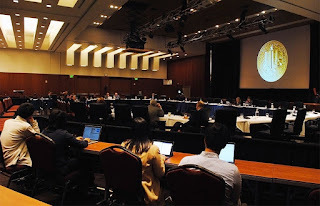 Yesterday, the Council of UC Faculty Associations (CUCFA) has written a letter to state Senate President Pro Tempore Kevin de León asking that "the California Constitution be followed when nominating Regents to the University of California." I'll discuss the letter and why we would need it in the first place. a financial manager (Maria Anguiano, 38, joining Bonnie Reiss and Richard Blum). Anguiano would be the only regent in recent memory to have direct UC administrative experience. She'd add to the Board's very rare higher ed expertise, now represented by Regent Eloy Ortiz Oakley, the chancellor of the 113-campus California Community College system. Anguiano served as Vice Chancellor for Planning and Budget at UC Riverside. Regents shall be able persons broadly reflective of the economic, cultural, and social diversity of the state, including ethnic minorities and women. However, it is not intended that formulas or specific ratios be applied in the selection of regents. In appointment practice, the state's large poor population is unrepresented. Its embattled middle class is barely there, in the distorted form of political lobbyists and senior managers who may get close to top 1% salaries but not to the 0.1%. The sole public education official on the appointed Board, CCC Chancellor Oakley, is probably the Board's low-income member. Of the 18 appointed regents, including the four just named, half are financiers, corporate executives, investors, real-estate developers or corporate attorneys. Three are former politicians. One is Brown’s senior policy adviser, and another — a former finance expert at UC — is chief financial officer at a company that supplies technology to a private college in San Francisco. The others are an eye doctor, a Sacramento lobbyist, a nonprofit policy director, and the chancellor of the California Community College system. The governor's appointments are out of compliance with this section of the constitution, as have been all of his predecessors. Second, the 1974 reforms set up an appointment advisory committee that the governor is to consult prior to making appointments (paragraph 6(e)). The Chronicle reporter Asimov looked into the functioning of this advisory committee and found that it never met or advised. Her piece was entitled, "Are governors ignoring law when appointing UC regents?" [S]ix committee members reached by The Chronicle said they are never consulted in the selection of regents — only told shortly before the announcement that choices have been made. Whether the governor is breaking the law would be up to a judge, said Jessica Levinson, a law professor and government ethics expert at Loyola Law School. "But it’s pretty clear that it doesn’t meet our expectation,” she said. “Our general expectation of ‘consult’ is that it’s distinct from ‘informing.’ You wouldn’t say, ‘I’m consulting this person by leaving a note on their door.’"
If by "note" you include email, this kind of executive not-consulting is routine. That's why consultation was written into the state constitution in 1974. Acting like the 1974 process doesn't exist also miseducates the regents themselves. "I had no recollection of the existence of the committee in my 14 years on the Board of Regents,” said Bill Bagley, who was named a regent by Gov. George Deukmejian in 1988 and served in the state Assembly when voters approved the advisory committee. Bagley, an expert on government ethics for whom California’s Bagley-Keene open records and open meetings law was named, said the committee should have at least a week to opine on the governor’s preferred regent candidates. That would make sense and be easy to do. It would also bring the governor and UC into compliance with the state constitution. If the governor complied with 6(e), consulting the advisory committee, it would make it easier to come into compliance with 5(d), appointing a representative Board. A recent regent made this point. Fred Ruiz's departure from the Board reduced the presence of the Central Valley on the Board from one to zero; he sent a list of 20 Central Valley candidates to the governor's office, to no avail. “'This is another example of the governor essentially dismissing Central California as a flyover area,' said Assemblyman Jim Patterson, R-Fresno.'" A functioning advisory committee would have members from the Central Valley to funnel local names to the governor. In addition to geographical diversity, the Board needs demographic and intellectual diversity. It needs a wider range of experience and perspectives. If it had this, it could synthesize the expertise of a new member like Maria Anguiano into sophisticated policy deliberations rather that treating her accounting perspective on instruction as an override. Unfortunately, as I'll explain, the latter is more likely with the current Board. Anguinao's roots are in finance and accounting (Barclays Capital and Deloitte & Touche). Gov. Brown may have wanted her experience in financial statement analysis, which often seems to be lacking on the current Board. But she is also a well-known advocate of a kind of accounting known as Activity-Based Costing (ABC), which assesses the cost-effectiveness of any activity by breaking it down into its component inputs. ABC is preoccupied with instructional costs, which fellow advocates like William F. Massy, author of Reengineering the University, see as a serious burden that accounting must help reduce. In his book, Massy names Anguinao as an important ABC champion, one who is bringing the ABC message to the University of California. She has certainly brought the message to UC Riverside. rich data for University leaders to better plan enrollment and determine which, and how, courses should be offered by understanding costs coupled with student outcomes. The Administration will continue to monitor the University’s experience in using the information. The state defines efficiency here as financial managers guiding curricular planning with cost data. Music department courses are more expensive than Sociology's, and under permanent austerity this is a continuous grinding issue. ABC could consult its component analyses to discover that some of music's costs come from very small group instrument training and the maintenance of practice rooms, not to mention tech costs of connecting students to the incredible world of sonic innovation. This would be useful information for departments to have during their expert deliberations of instructional needs in the context of wider developments in the field. But the state's model is that managers do the planning and deciding of "which, and how, courses should be offered." As institutionalized in budget documents, ABC can be used to compromise faculty's academic freedom to decide curriculum by presenting "there is no alternative" budgetary quantifications. I'm not saying this need actually happen, but it is more likely if the Board is not made aware of the issue and if the University community does not discuss it. A bit more on this topic: this blog has always called for more rather than less financial information, so ABC would seem to fit with that. But our model is that open deliberation on educational goals should drive budgeting, and ABC, like audit practice in general (a classic work can be purchased here), does the reverse; in the language of ABC slide 18, it "allocates direct [and indirect] costs to programs using cost driver based allocation." Suffice to say for the moment that its normal practice is that components of education (course development, advising, etc.) are benchmarked, standardized across disciplines and institutions, put into competition with each other, and, in general, cut: the core goal of ABC is not budgetary transparency but cost reduction. For example, ABC as an audit technique creates benchmarks from average costs that then implicitly question any cost that is above the benchmark. The audit question is not, "How can we make Music instruction more effective in pursuing educational goals XYZ, but "Why does Music cost so much?" a few large, concentrated players that will provide infrastructure, platforms, and services to support a wide array of fragmented niche providers of content, formats, environments, and experiences. I'm citing a post on Deloitte Consulting's "university press" (that thanks Maria Anguilano). At the same time, Minerva charges $28,000 a year (including room and board) for online contact with a course delivery platform. As I discuss at length in The Great Mistake and elsewhere, this defies two centuries of research on the practices of deep learning in the context of the university as a unique institution focused on knowledge creation and full social development. Minerva's ludicrous selectivity (158 admits from 16,000 applicants) means that learning success should be largely attributed to the ferocious cherry-picking of the admits, again in defiance of the "learning gain" movement. Nelson also seeks to make the for-profit college the normal mode of higher education delivery. Nelson's current Chief Financial Officer is Maria Anguiano. Often boards appoint members who bring relevant expertise and new perspectives, and Anguiano qualifies on both counts. Good debates could follow--if and only if she were to join a Board of Regents with many experts in education or at least diligent executive learners who engage in deliberative reflection. She could advocate for her controversial accounting technique that among other things helps accounting override intellectual and educational considerations, explain why she thinks it does more good than harm, and hear informed criticisms. The same might go for the conflict of interest raised by having a regent also serve in a senior management position at a for-profit college that benefits directly from the declining performance of the public university sector, including UC. Universities generally manage conflicts of interest rather than eliminating them, but the conflict needs to be out in the open so that it can inform Board evaluations of Anguiano's statements. There should also be a decent balance of intellectual power on the Board itself. This is especially important in the Silicon State where everything public is presumed guilty until proven innocent, especially universities. We've already had the governor-mandated MOOC fiasco at SJSU, where Valley salesmanship outstripped research, with the product being deemed "crap" by its own creator (Udacity's Sebastian Thrun) once the research was actually done. California has a history of business titans imposing their models with little public review or consent. The 1974 reforms were part of yet another attempt to manage business conflicts with the public sphere. Some observers have previously pointed out this failure of Board of Regents appointments to comply with the state constitution. UC Berkeley physics emeritus professor Charles Schwartz proposed corrections in the course of a report on the Board's financial interests, back in 1991. As it happened, Crane served a year on the Board as a designate and then had to step down when the Senate Rules committee failed to confirm him. This does sometimes happen. Rosen's call for professionals and humanists on the Board should be taken seriously. It was in effect a request for representatives of the ancient and continuously-evolving philosophy of higher learning, which sees it as a public good. A fully constituted Board of Regents would see commercialization and the dominance of UC "businesses" as often in conflict with higher learning, and discuss policies of rebalancing that are not set in advance by our state's tech predestinarians. I'm putting words in her mouth. Rosen did argue that Crane would be yet another addition to the Board's finance bloc that had not shown much support for the educational core. But the arguments for compliance with the state's constitution are independent of a particular appointee's expertise and views. Boards are always a mixed bag, and our current UC Board of Regents is arguably better and more diverse than most of its predecessors. Eloy Oakley is an experienced, formidable community college administrator with meaningful social justice goals; John Pérez has been a strong advocate for access and affordability; Eddie Island has often spoken on behalf of low-income students and students of color; Hadi Makarechian does his financial homework and asks real questions about budgets and capital project costs. But this is irrelevant to the legal question: to quote an SF Chroncile editorial, the governor should follow the law. CUCFA's June 19 letter to the state Senate president says that the slant of the Board towards business elites has biased policy in favor of raising tuition and against state funding. The fact that [The Board of Regents] is dominated by wealthy interests for whom the steadily increasing costs would not be a practical problem may help explain the lack of urgency in building the confidence of the public and policymakers needed to restore tuition-free education at UC. Sociologically, this is likely. There is now solid empirical research showing that elected representatives reflect donor and financial network influence rather than the public's policy preferences. This applies to the UC Regents, who are appointed largely from donor circles. Therefore, we respectfully request that the Rules Committee enforce the California Constitution by immediately rejecting (without prejudice) the Governor’s nominees. Regent terms begin as soon as the Governor nominates them, so these improperly nominated Regents can vote on issues at the upcoming Regent’s meeting unless the Senate Rules Committee acts quickly to reject them. We also request that the Constitutionally-required advisory committee be more than a pro forma process and that the Senate state that it will only consider Regent nominees that have been vetted through an open public process. Meetings should be conducted in accordance with the Bagley-Keene Act, including proper public notices of meetings with opportunities for public comment. The rejection of the current slate should not preclude these candidates from being considered in the future via the proper advisory committee process. It would be great to start this month's appointment process all over again: we'd get back in line with the state constitution's procedure, have a more diverse group of nominees, and have the kind of deliberation that would raise our collective IQ about UC's future. Gov. Brown could propose at least one regent form the Central Valley while increasing the Board's level of educational expertise. Some of the current Four could be renominated--if they helped Board thinking move beyond Hollywood, FIRE (fire, insurance, real estate), and tech. There's a deep issue at stake here. The university is now immersed in a pragmatic policy discourse that the philosopher Peter Sloterdijk would describe as "cynical reason." It's a kind of functionalist management of conflicts that focuses on short term fixes rather than long term goals while assuming there's nothing we can do about this. It is in contradiction with the University's historical destiny--just to use a language pitied by cynical reason. It is also the modality of political burnout and dynasties in decline. A good example is all California governors blithely ignoring the constitutional requirements for appointments to the Board of Regents, with the consent of the university's officials. We don't need to have such low standards for our officials, and we mustn't.